Within Teamwork Projects, you can move or copy a task list to another project, or make a copy of it in the current project. Click the task list options down arrow next to the task list name and choose Move or Copy. In the copy/move modal, you can choose whether you want to copy or move the task list, and pick a destination project. Note: While it's not possible to merge projects, you can use this option to copy all task lists from one project to another if you would like to combine two separate projects. 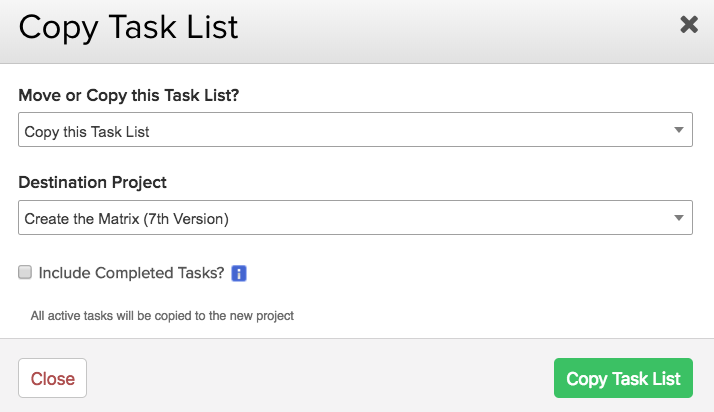 When copying a task list, you can choose whether you want to include completed tasks in the copy. Comments and time logged will not be copied. When moving a task list to another project, all comments and time logged on the tasks will also be moved to the new project. If a task being moved is assigned to a person who is not a member of the target project, the task will be re-assigned to Anyone.